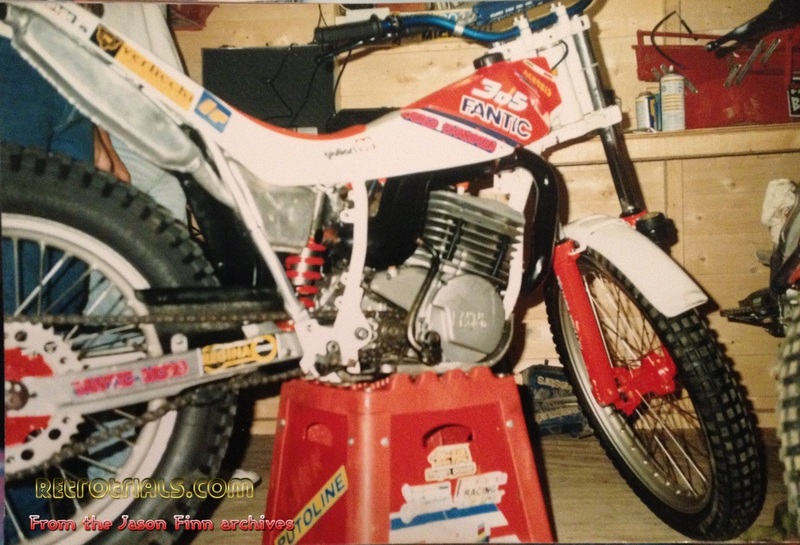 My first actual bike before the Fantic, had been a red 175 Kawasaki trials bike. I know it was 175, because dad paid £175 for it when I was 14 (1984). We didn’t know that we had to put oil in with the petrol, so obviously seized it. I didn’t have this for long. Then a blue Bultaco Sherpa 350….. Dad got me this end of 84', it was mint and cost 450 quid which my dad paid for. It was what kept me happy, so he got it for me. I rode it twice as there was no where for me to ride, it was a piece of furniture in my garage, I just use to look at it. I started riding a little with a friend of mine named Gavin Cooper. We were the ‘perma’ tan boys. 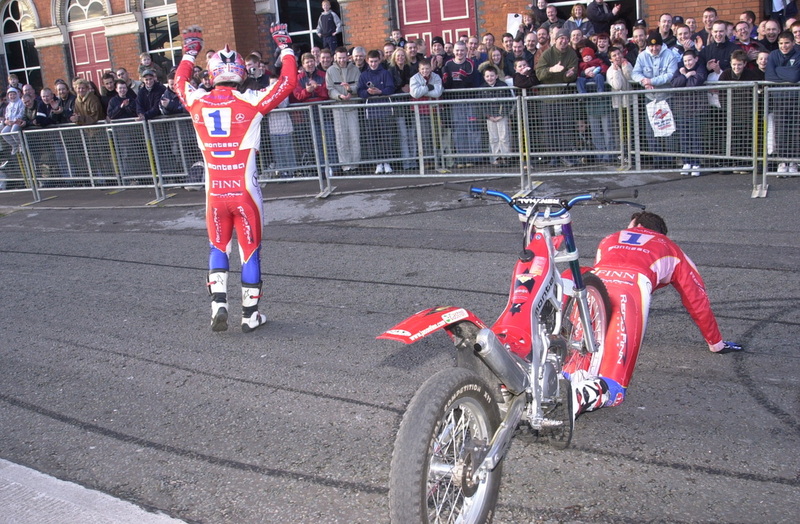 Gavin was a very good rider, he rode the 311 Montesa and won the British Clubman’s Championship. Gav is what I call a traditional rider, very smooth. 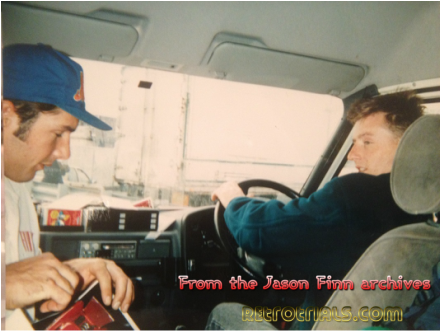 Me and Gav were inseparable, apart from being best mates, we rode together and had a social life together. Gavin was with Roy Carey from Fantic, so after my Fantic 243, I got from Paul Smarts, I went and bought a brand new yellow tanked Fantic 303, same one that Steve rode and won on it at Butser Lime Works. Gavin gave me a 1987 World Round video with Jordi Tarres on it. The acquired Jordi 1987 beta Tape, what can I say about that Video? That was where my life changed. I immediately got rid of the Fantic and went out and bought a brand new 1988 blue top Beta TR34. 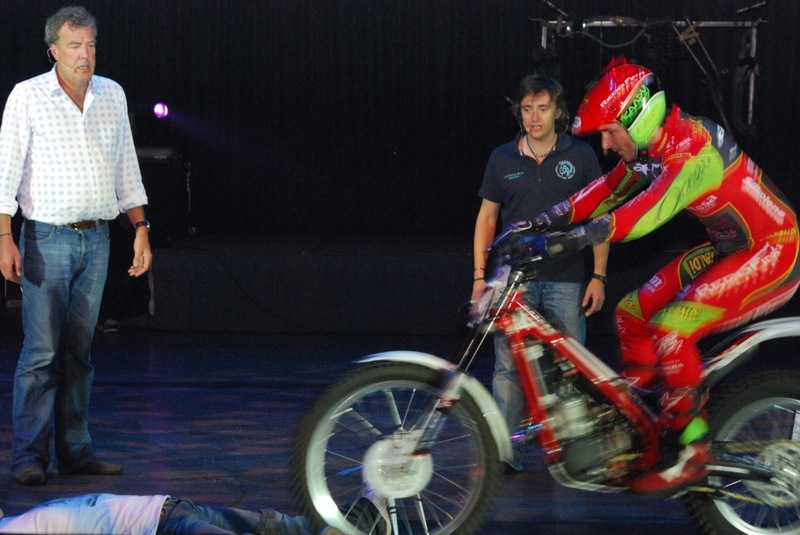 The other video of Jordi was a trial, showing the USA World round. All of the Americans were going mad cheering. I remember thinking to myself “I want to be him”. I remember Tony Scarlett being on the video too. 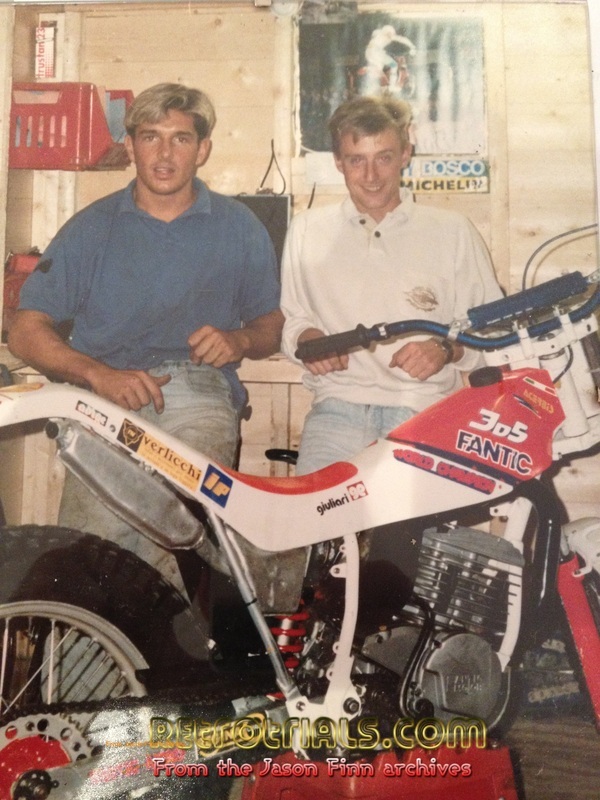 In 1990 when I rode the Beta Zero, Roy Carey asked me if I wanted to buy Steve Saunders Factory Fantic 305 (Not To Ride), I said of course. Steve wanted the bike back, I said on one condition, I want the rear shock off it, he said ok. So Steve came down mine and picked it up, that would be worth a small fortune now. Steve was on a Screenart Beta at the time. Had you started riding trials at the time? Just a few, Gavin had been riding since he was a kid. I respected Gav, I looked up to everyone really. 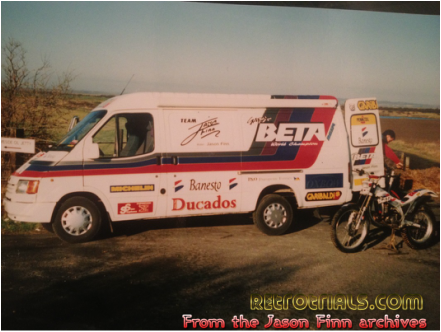 I don’t think I rode the Fantic 303 at a trial, I didn’t have it long enough before I got the Beta. The Fantic that I had before (243) was ridden by me, in a couple of trials, but mainly I was just practising and playing in the woods. Did you manage to take over some tricks from cycle free styling to Trials? 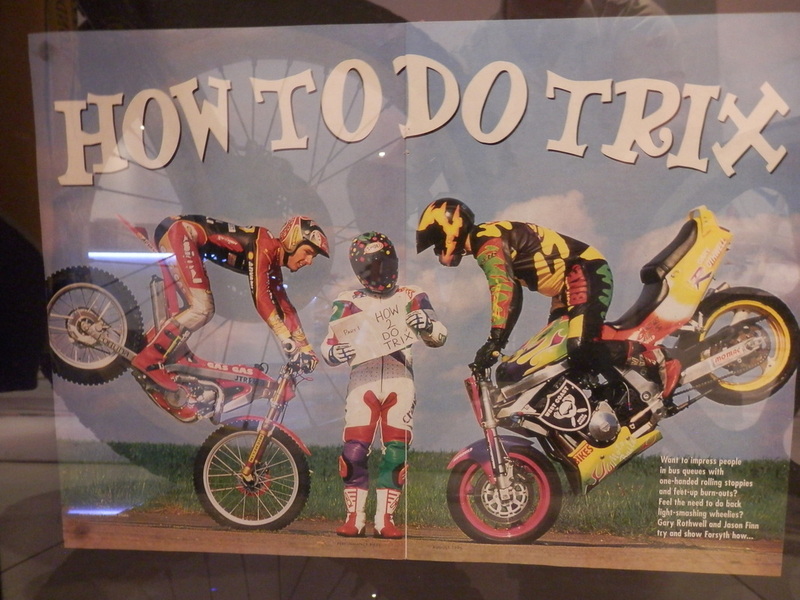 Yes, once you can do them on a bike, it feels natural doing them on a motorcycle. Kids train on Cyclo Trials now because it a great transition, back in the day no one realised how beneficial the transition was. I’ve just got a new Gas Gas From Johnus (Shirty) that I plan on riding shortly. I have got some plans for the future. I want to get some new tricks recorded digitally. They’ve never been filmed on video before and I want to get them perfected and recorded with me doing them first. I'm no way near as good as I used to be, but can still do some stuff that 99% of riders wont be able to do, not bad for an old git!! In the past, I have invented tricks and seen them stolen by other riders. In a funny way I like to be the first to do them, then no one can beat you to it. I hate people copying my tricks. The easiest thing to do when you are doing shows is to copy someone. The hardest thing to do is invent them. My friend Craig Clemons (Crutchless Craig) was the best at this, he was really hot at coming up with new ideas for tricks. Crutchless Craig was one of my mates who laid down at the events and shows for me from 2000 until I retired, there was also Bill Hales (Lip Scraper), he was a mate and was another guy who would lay down for me, he started at the beginning and finished in 1999/2000. 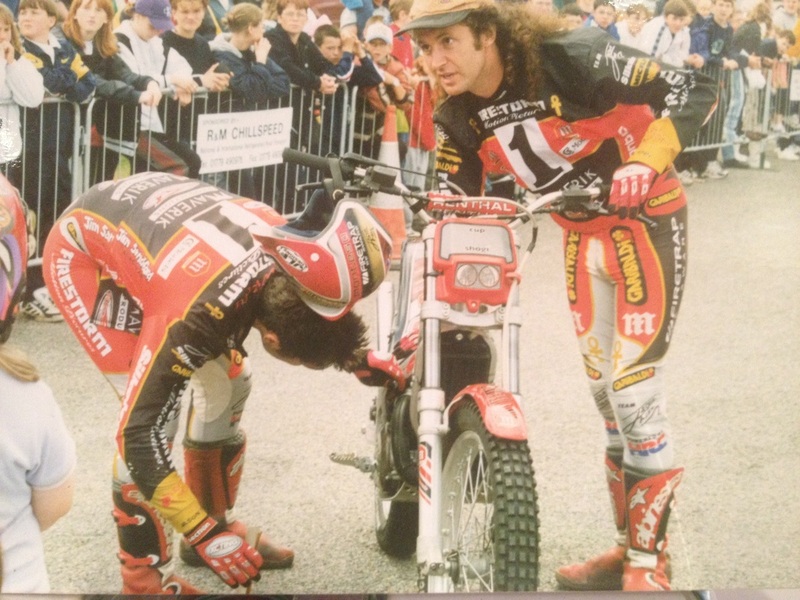 There is a trick called the "Arse Park", Craig would get on his hands and knees, I bunny hop him, go around the back and park my bike up his arse and walk away, the bike just sits there, its not a hard thing to do but its funny and the crowd like it. There are is a trick called "precision misses" where Craig would lay down with his legs closed and I would put the front up above his legs and drop the wheel and he would open his legs just in time. He would then move his arm just in time again for my front wheel to slot in. It was all carefully synchronised. Another trick was the endo catch. I would come along on the front wheel at 40mph and he would catch the handlebars and I would be caught up at a 45 degree angle just staring at them. There is a wheelie catch. I would come along at about 40 mph and go up past vertical and slow it all up on the back brake and when I get near him I would make the front wheel come down slowly and he would catch the front wheel still in a wheelie. He would then push the front wheel and I would go round in a 360 degree circle and he would catch the front wheel again. There were loads that Craig came up with. Craig invented so many tricks. The skid 180 which I do see other riders do, I want these new tricks recorded in film, not digitally, it’s so much better. For the first year of me riding I was just practicing trials with Gavin and some others, not riding competitions. Later I did a few trials but I hated the mud. Then I got the Beta. Jordi’s video had inspired me. It was how I would have expected a bike to be ridden. When I got on my trials bike practising, within a couple of months I was doing 180 degree hops easily back in the late 80’s. I was really good at this. Back in 1989, 300 degree flick turns, hopping on the back wheel. I don't care what anyone says, I was the first to do this. 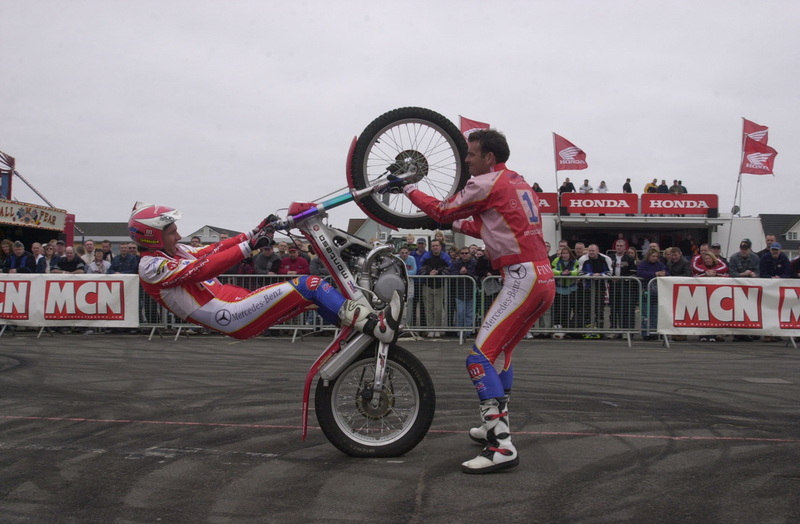 Gav Cooper use to watch me do them all the time in 1989 on a Beta stripey, I use to do them in Shows that year too!